Wedding day; arguably the most important events of a couple’s marriage, second only to perhaps the engagement day itself. All girls dream of big, superfluous weddings, where fathers will shed tears of joy and they will illuminate the day like they themselves are shining; but it’s the little things that you should start. 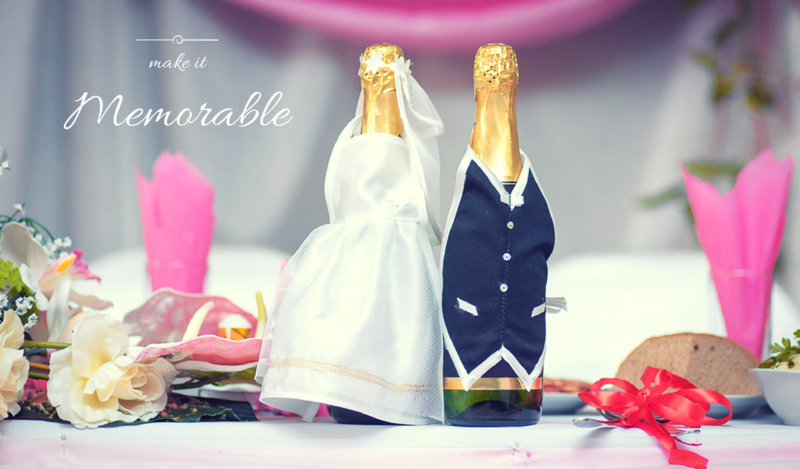 Among many things, fine wine is a definite pointer towards beauty at a wedding, make it personalised and you have something else – you’re flying on your own level – the guests will no doubt be remembering the occasion for quite a while. A good wedding should not only look good, the food should be delicious and the guest equally satisfied, but a great wedding should really out. It should be unique, memorable, and again, the food should be great – custom wine does all three for you. Personalised wine is like ordinary wine, only with a certain flair of uniqueness. It involves etching certain engraving on a wine bottle in order to mark a momentous occasion, in this case, your wedding day. So, instead of having ‘La Marca Prosecco’ or ‘Cockburn’s Fine Tawny Port’ on your bottle, you could change that and instead ‘Jack and Jill’s Big Day’ or something. Selecting the perfect bottle of champagne or wine to customise can feel like shooting fish in a barrel when you have so many exceptional wines to choose from, but all in all, you just take fine wine and make it even finer! How much wine is enough? Some venues don’t allow a self-supply of liquor, but if it does, you need to spend some time getting your hands dirty with math in order to determine how much wine you are going to need. Some venues normally charge a corkage fee – a flat rate charged for each bottle opened, but if you are able to purchase your wine at a wholesale price instead, you will save quite a considerable amount. The amount of wine you buy should mainly depend on the number of guests you expect to have and at what point you are going to serve the drinks. However, the actual amount of wine that is going to be consumed is nearly impossible to predict and it’s, therefore, better to have extra than not enough. For instance, if you’re doing a champagne toast and don’t expect to drink anymore afterwards, one bottle should be sufficient for every 8 guests. The glasses additionally don’t need to be completely full – only 1/3 or maybe ½ of the way up. Doing some rough math gives an approximate 14 bottles of champagne for every 100 guests. A good rule of thumb to follow is by assuming each guest is going to consume about two drinks during the cocktail hour and at least one drink per hour after that. Of course, it isn’t entirely accurate as some guests won’t want to drink in the first place. Also, if you know your guests are big wine drinkers you’ll need to adjust accordingly. What type of wine should you pick? Sorting out the number of liquor bottles and the exact type of wine you’ll need is, on the other hand, a little trickier, given that there are a lot more options and it’s pretty difficult to gauge what your guests will be in the mood for when the time comes around. If, for example, you opt for a signature cocktail, make sure you have enough to serve each guest one glass per hour for the duration of the reception. Dirtying our hands with the math once again says if you have a hundred guests and your reception is scheduled to last around three hours, you’ll need at least 300 servings of your cocktail. If you are, however, chosen to go with a limited bar and have selected all your spirits and wines, you can do some rough math once again – a 750ml bottle has approximately 18 servings in it. Once again, you should know how much wine your guests consume and be able to plan accordingly. You should also be able to estimate which liquor brands will be more popular and purchase as much of it as necessary. If you’re still unsure how much of each type of liquor you should buy, 4 bottles of vodka, 2 bottles of bourbon, 2 bottles of gin, 2 bottles of rum, and 1 bottle of scotch should be enough to satisfy all your guests. The wine order should be split between sparkling, white and red according to the kind of food you have on your menu. Remember, the wine is only as good as the food that accompanies it. The process itself involves laser use of state-of-the-art laser etching machines to engrave whatever design you have in mind directly onto the bottle. The etch can then be filled with gold or silver paint to give it an extra pop, depending on what you want it to look like. The result is nothing short of stunning. The prices of personalised wine on the market vary according to your needs – your design and the kind of wine you need to buy (if you’re buying them pre-etched). It goes from $15 all the way to $3000 for the most complex designs that take a longer while to engrave onto your bottle. You perhaps shouldn’t worry about that because a simple ‘Jack loves Jill’ could do just fine for the occasion. 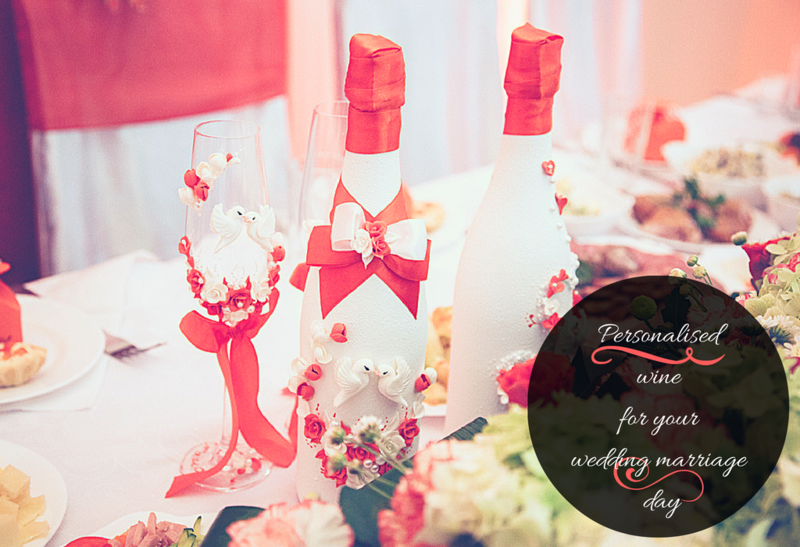 Fine wine is a must-have for a great, memorable wedding. So why not go out of the way and make it even better by making it even more attractive with gold and silver shades, or whatever your wedding theme colours, engraved onto your wine bottles? Your guest will love it, and without a doubt, so will you.